When the code executes db.SaveChanges(); the code executes as expected but the database doesn't get updated. 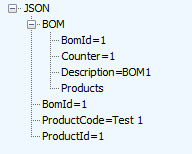 What this method does is get the product requested (1), updates a field in the child (BOM.Counter) by incrementing a value on that field. It's just that the database does not update so when the application starts again, obviously we're getting the old value and not the updated one. The SaveChanges method seems to execute but the database doesn't suggest that it has. I'm hoping someone can see where I'm going wrong. Any help would really be appreciated. 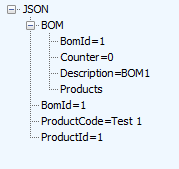 Your problem is that because you have a parent entity with a child entity, You are setting the parent's entity state to be Modified but what changed actually was the child entity, so you left the child's entity state to be Unchanged (Entity framework does apply the modified state on single entity not like "Added" which will be applied on the whole graph), so on the server side if you just set the BOM entity state to be Modified, you will get your changes into the database. Now what I suggested is not a permanent solution, but this is just to show you your problem and how to solve it temporary. To solve it permanently and because your client is a disconnected graph, your client needs to track the objects and being responsible of what happened with the graph entities (added, modified, deleted, or unchanged). You need to implement an interface like IObjectState and let your clients change the state of the disconnected graph and on the server you convert that state to the entity state in before you save the entity. Look at my answer here from a detailed answer. Not the answer you're looking for? Browse other questions tagged json asp.net-web-api json.net entity-framework-6 or ask your own question.